← Get a grip about Amazon! They’ll sell your books. It is obvious that even the terminology is different. However, we have hardly begun. Much more significant than the new language are the actual mechanics of typesetting. The rules have changed! In fact, one of the difficulties in teaching publishing classes today involves a paradox. Writing classes are secretarial. Classes all teach writing using Word: but Word cannot produce professional typography or the formatting services required by the reader. Writing groups assume Word: if you give them a PDF many will freak out. Learning to type in a keyboarding or word processing class teaches students so many bad habits that you wonder if it is worth it: you’ll need to train yourself how to write fully formatted. As an author, typing skills obviously help. However, you are wasting your time and confusing the entire process if you do not learn to type, format, and edit professionally. To do that you need InDesign. Your background can vary so much that I can’t begin to guess what you know and what you do not know. This portion of my typography postings covers materials that you probably do not know unless you have studied typography a little and used a page layout program like InDesign for awhile. It is for Office users, primarily. However, I am fully aware that many users of InDesign do not have any typographic training. So, this stuff may be a revelation to you also. Most of you will find, to your dismay, that many of the things you thought you knew about typing and word processing are simply wrong. Professional type is a whole new world. Things you were taught as necessary now become typographical errors. Your readers can give your books a bad review because of one typo (or typographic error). Many typos are taught as correct writing by people who do not know how to design a book. Type is where the rubber meets the road. At this point, we’re going to talk about some major differences. It is very important to realize that these differences are not minor quibbles. They have a major effect on your ability to communicate with type. They are absolutely necessary for professional document construction and career advancement. One of the major concepts of book design (often lost by traditional graphic designers) is the centrality of the copy. Our entire idea is to provide the reader with content which meets his or her need. More than 95% of this communication will take place through the words you place on the document. In fact, most of the books you design will have few graphics—unless you specialize in non-fiction skill training as I do. The old proverb is that a picture is worth a thousand words: This is true, but it takes an exceptional picture to express exactly the thousand words necessary to produce the desired action on the part of the reader. These pictures can be produced. However, they will take you lots of time and money plus the services of an exceptional illustrator or photographer. Even exceptional designers can rarely pull it off without needing additional explanatory verbiage. As wonderful as the mutt below is, explanation is needed. So, in the real world, you will be dealing with words, but we are talking about typeset copy, not typewritten words. Here’s a picture: I wish you could tell me what the 1,000 words are. 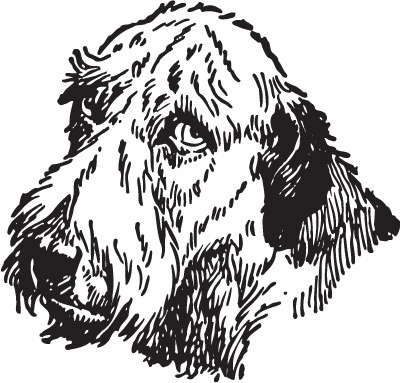 In nonprofessional work, graphics are often just dumped in place with no reason at all — just like the sad mutt above. This is why I emphasize type so strongly. Without type knowledge you will have a hard time communicating. Type is typeset, and that is one of the major skills you’ll need in your career. Actually, you do. One of the things of which most beginning designers are not aware is the extreme (but usually subconscious) distinctions between what I call secretarial type and professional typeset copy. You are very aware of the differences—just not on a conscious level. You have been making decisions about companies, products, and services for years that are based, at least part, upon their perceived honesty, integrity, trustworthiness, and so on as seen in their advertising and marketing efforts. This is true in books also. Many of your readers’ perceptions about your concept and content will come from reactions to type used not only inside the book, but on the cover. It is likely you cannot explain the difference at this point. However, you can tell at a glance whether something is bureaucratic, cheap, top quality, and so on by the typography. The problem, of course, is that everyone now believes that they have the capability to produce writing—whatever that means. It is possible (to a very limited extent) in Word, and that covers almost everyone. It is very difficult to generate professional typography in a word processor though. All of this is confused by the fact that everyone has access to the same fonts, and the same basic capabilities. Most people simply do not have any idea how far typography goes beyond word processing.